The Nonsteroidal anti-inflammatory drugs (NSAIDs) are a drug class that has become one of the most commonly used drug types in the United States. Following unanticipated study results linking drugs in this class to an increased risk of cardiovascular events and death as well as increased bleeding in the GI tract, a black box warning was added to all of these drugs pointing out the cardiovascular and GI risks associated with taking them. This group of drugs includes propionic acids, acetic acids, fenemates, oxicam derivatives, and cyclooxygenase-2 inhibitors. The classes are defined by chemical structural differences, but clinically, the NSAIDs are all-inclusive. See the below table for a list of these drugs by group, as well as their specific indications. The choice of NSAID depends on personal experience and the patient’s response to the drug. A patient may have little response to one NSAID and a huge response to another. It may take several trials to determine the drug of choice for any particular patient. NSAIDs are structurally varied compounds with common therapeutic effects. NSAIDs reversibly inhibit the enzyme cyclooxygenase, which is responsible for the production of prostaglandins from arachidonic acid. The anti-inflammatory effect of NSAIDs is through the inhibition of prostaglandin production, and they may also inhibit neutrophil migration via unclear mechanisms. NSAIDs are antipyretics through inhibition of prostaglandin E2 in the hypothalamus. NSAIDs attenuate prostaglandin-mediated hyperalgesia and local pain fiber stimulus. All NSAIDs are rapidly absorbed from the GI tract, and most achieve peak serum levels within approximately 2 hours. They are highly protein bound in the plasma, have low volumes of distribution (approximately 0.2 L/kg), and cross the blood–brain barrier. NSAIDs undergo metabolism mainly in the liver via glucuronic acid conjugation or via liver enzymes before elimination in the urine or feces. Plasma half-lives of NSAIDs range from 2 hours for ibuprofen to greater than 50 hours for the long-acting agents piroxicam and phenylbutazone. Creation of active metabolites may prolong the therapeutic effect beyond that of the parent compound. Ingestion of large amounts of some drugs, such as ibuprofen and naproxen, exhibits slower absorption, taking 3 to 4 hours to achieve peak plasma levels. As greater amounts of NSAIDS are absorbed in large overdoses, greater fractions of free drug become available for toxicity in a nonlinear manner because protein binding is limited. Adverse reactions chiefly involve the GI tract, particularly erosion of the gastric mucosa. The most common symptoms are abdominal pain, epigastric distress, heartburn, and nausea. 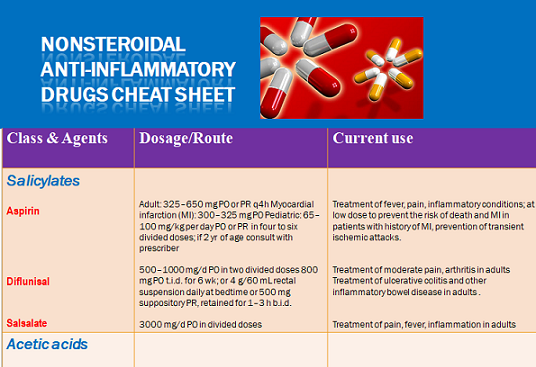 Nonsteroidal anti-inflammatory drugs include the following.